So I just finished my sophomore year at UGA, and I am packing and getting ready for my summer up in North Carolina, where I will be living and working at the Nantahala Outdoor Center. Needless to say, I am super pumped. But since it’s been a while since I’ve updated, how about a recap of my semester? The semester started out with kayaking, and my coach Maurizio Tognacci was visiting from Italy. He was here just in time for the annual Chute the Hooch training camp in January. Despite the winter weather, we had a big group of kayakers, ranging from adventure racers to flatwater racers, to people who have been on the wildwater team for the past decade or two. 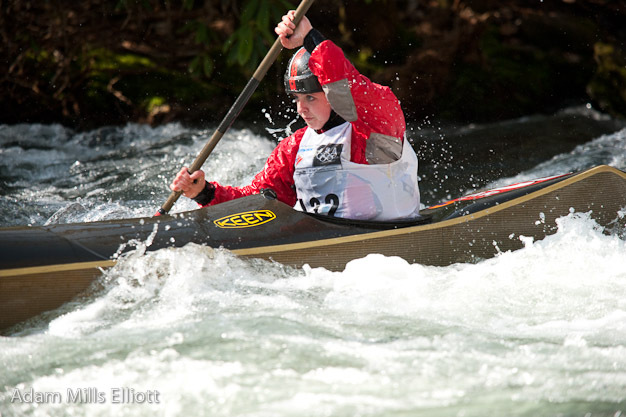 After the Chute the Hooch camp, the next focus was on Team Trials, which were held on the Nantahala River at the end of March. Every weekend I could get up to the Nanty, I went up to train on the course. The training definitely paid off, because I had a few great races. The other women competing were really strong this year, most notably the up and coming Haley Popp, who is still a junior and almost gave me a run for my money in the sprint. Susan Hollingsworth is a newcomer to the racing scene, but she had a great classic run and came in a close second. My times at the end of the weekend were enough to win a spot on the US women’s senior team for 2010, and gave me the opportunity to race in Europe to represent the US. One unfortunate thing that happened that weekend was that I hurt my shoulder during my last race. I saw the sports medicine doctor at UGA, and he prescribed me a month’s rest from kayaking/swimming/climbing/etc. to allow my rotator cuff to fully heal. It has been over a month now, and I have only climbed on it, but it is feeling much stronger that it did right after Team Trials. Hopefully it will hold up for the rest of the summer, since am planning on getting lots of training in and racing at Nationals on the Skagit River in Washington at the end of July. I am very excited to kayak every day this summer and to train alongside Chris Hipgrave and JP Bevilacqua. I will definitely miss the climbing community from UGA, and I hope to spend my days off on some climbing trips with them this summer.